In the absence of an Advance Directive others are forced to make end-of-life decisions on your behalf, possibly resulting in you being subjected to unwanted and aggressive medical intervention. An Advance Directive is a document in which you make known your wishes for your personal care, and for your medical treatment or non-treatment. It only comes into effect if you are found to lack capacity to make personal decisions. Please scroll down to the bottom of this page to download your copy of our Advance Directive and Planning Guide. 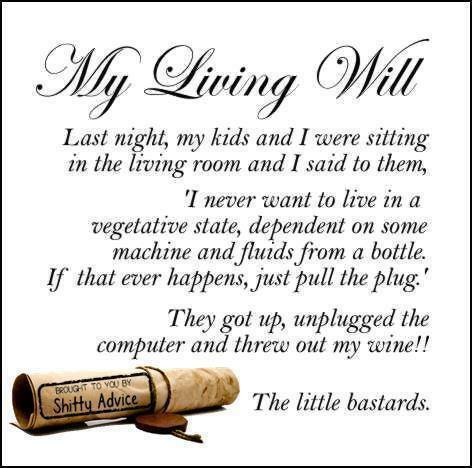 A ‘living will’ is an instruction directive by means of which a competent person instructs others to withhold or withdraw potentially life-sustaining treatment should they become incompetent to refuse such treatment themselves. For example, a person may sign a document instructing others to withhold or withdraw all medication such as antibiotics and including artificial nutrition and hydration, should they fall into a permanent vegetative state (PVS) or become irreversibly non-responsive. A ‘durable power of attorney for healthcare’ is a substitute directive by means of which a competent person appoints or mandates a specific person as their substitute (proxy, surrogate) healthcare decision-maker should they become incompetent to make their own healthcare decisions. Such a power of attorney may confer general decision-making powers on the substitute, for example, to make all healthcare decisions – including decisions about refusal (withholding and withdrawal) of potentially life-sustaining treatment – on behalf of the patient. In addition, the substitute decision-maker may also be given specific instructions, for example to refuse potentially life-sustaining treatment in foreseen circumstances, such as severe and irreversible lack of brain function. This kind of power of attorney is durable because once the patient becomes incompetent it remains in effect. In a medical emergency, or any other circumstance which leaves you unable to communicate, your Advance Directive will help those responsible for your care to decide on your treatment. It will help your loved ones to make the right decisions on your behalf. Planning ahead with an Advance Directive can give your principal caregiver, family members, and other loved ones peace of mind when it comes to making decisions about your future health care. It lets everyone know what is important to you, and what is not. Talking about death with those close to us is not about being ghoulish or giving up on life, but a way to ensure greater quality of life, even when faced with a life-limiting illness or tragic accident. When your loved ones are clear about your preferences for treatment, they’re free to devote their energy to care and compassion. An excellent End-of-Life decisions pamphlet of the Alzheimer's Association can be found here. Before downloading, please bear in mind that we would welcome a R50 donation (or more) for the use of these important documents.